'Solo: A Star Wars Story: Expanded Edition' novelization review: So good it makes me want to watch the movie again right now – AiPT! This novelization explores the events of ‘Solo’ from multiple characters’ points of view, offering a far more complete experience than the movie. The latest Star Wars film to be released, Solo: A Star Wars Story, has recently been given the novelization treatment — this time by first time Star Wars novelist, Mur Lafferty. Mur has also written two Star Wars short stories previously, one tying in to Rogue One, which was featured in Star Wars Insider 170, and another short story that was in the tome From a Certain Point of View. My own views on the movie version of Solo were mildly disappointing. The movie was fine — I didn’t hate it, but I didn’t love it either when I left the theater. To this day, I have only seen it that one time on opening day. I bought the Blu-ray but still have yet to watch it because I wanted to go into the novelization fresh. I have stated before in my previous reviews of novelizations that I am not a big fan of the Star Wars novelizations as a whole because generally they are pretty rote. They place the scenes from the movie into a book, expand upon it mildly, and there you have it. Nothing, or very little, to enhance the experience. Recently though, that has been changing. Out of the four Disney Star Wars films (that’s right, Disney now has more Star Wars movies than were in the Original Trilogy), three of them have actually been pretty fantastic. This all started with the great novelization of Rogue One and followed up by the superb novelization of The Last Jedi. And it continues with Solo. The novel is laid out so that it is presented from the perspective of characters in the story, but that perspective shifts as the narrative plays out. It also shifts depending on whose story we are learning more about at the particular moment. The problem with not having seen the movie in so long was I was not entirely certain how the movie opened up. The beginning of the novel didn’t fit with what I remembered exactly from the movie, but it made sense. Having just gone back to check out the beginning of the movie I now know that yes, the book expands upon the opening quite a bit. Where we see Han hotwiring a speeder in the opening scene of the movie, looking all beaten and bruised, we find out in the novel how he was beaten and who were the people he was running from. We also find out how that ties in to the coaxium that he has to bargain with and leave Corellia. The early parts of the novel are well written and I enjoyed listening to it (in audiobook format), but I am having a little bit of a hard time being drawn into the novel at this point. The book does succeed at making me feel for the losses of Val and Rio much more so than the movie ever did. These were characters that I felt I had gotten to know much better. More so Rio in the book than Val, but both of them to a certain extent. Since this is essentially “Han’s” story, Val comes across as rather cold towards Han, and towards the reader. I don’t get the depth of character I would have liked from her and I still wish for more background stories with Beckett and his crew to fully flesh them out. I stated that this was essentially “Han’s” story, but in reality, it’s not. The jumping around of first person narratives lets the novelization become more than just Han’s story. Now we have Qi’ra’s story, and Chewie’s story, and Lando’s story, and L3’s story, all intermingled together into a symphony character arcs that makes me want to dive right back into the movie and see if all of these things were there in the first place and I just missed them. And this is where the strength of the novel shines through. We have expanded moments with the characters that we are growing to love. We find out more about how Qi’ra escaped Corellia to become a pinnacle member of the Red Dawn. Although I would actually have liked to have that kept more of a mystery to be explored later in other works, I just hope they don’t throw out the explanation given here. Her motivations and thoughts are also explored throughout the movie, especially how she feels about Dryden Vos and his control over her. But by far the best part of the novelization, which was also my favorite part of the movie, is Lando and L3. L3’s “sacrifice” at the end of the movie is explored in much, much more detail, showing the result of becoming integrated with the Falcon from her point of view. It also explores the quandary brought up by the movie by making a droid who was such a proponent of droid rights essentially become a slave to the pilot of the Falcon, whoever that may be. It’s better now; not perfect, but better. L3’s relationship with Lando is also presented center stage and I love it. We get more into his feelings for her and her feelings for him and how it might not be as platonic as you might think watching the movie. There is also a bit more with Enfys Nest, getting a little more into her backstory, but we also get a surprise at the end of the book. I totally didn’t see the epilogue coming and was ecstatic that it happened. It takes place after the movie ends, and I am not going to spoil it for anyone who wants to be surprised by it but it is totally worth just skipping the book and going straight to the epilogue. You’ve already seen the movie (obviously) so you can do this and it will make sense to you. You will then, obviously, go back and read the book from the beginning because it is that good. I made my way through this book by listening to the audiobook narrated by Marc Thompson, the stalwart in the Star Wars audiobook community. And while I do often have an issue with his female voices (Leia often sounds like every other female character), I think this was his best audio recording to date. I loved it. His Qi’ra was especially notable because it didn’t sound like Leia. I’d say my only qualms were with L3’s audio — it sounded a bit too modulated at first, but I eventually got used to it. Overall, I loved the book. Mur’s writing style is smooth and flows perfectly with the movie dialogue that we had been given before. I love all the expanded scenes, specifically the ones from the character’s perspective, getting a bit more on their backstories. And I don’t know what it was, but I love Lando even more now after this book than I did before, and I loved him before. When he shows up in the second half of the book, things kicked into high gear and I couldn’t put it down. Not something I would have anticipated if you asked me back in May after the movie’s release. 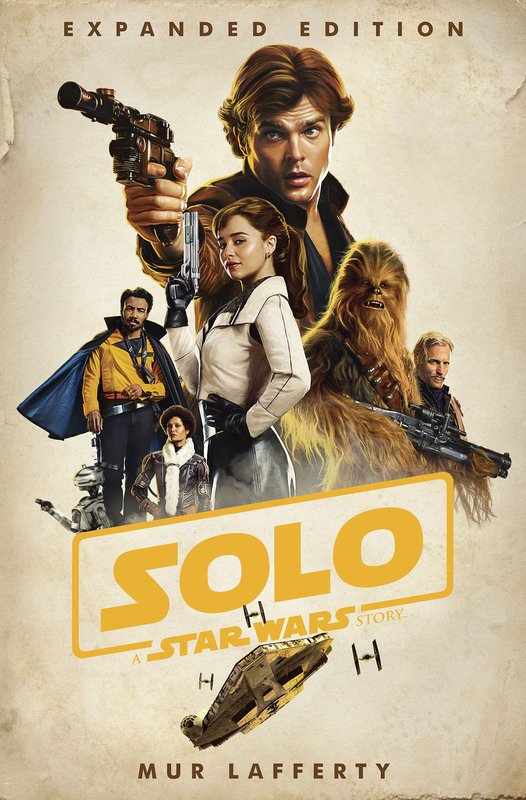 This novelization explores the events of 'Solo' from multiple characters' points of view, offering a far more complete experience than the movie.